English speaking only. PLEASE put your forum username (on either website) in your request to join. Question: how does promotion work? I'm considering joining, as my current clan, though run by one of my friends from the forums, is lacking in activity and I need those sweet, sweet clan chests. Promotion from my experience is just be active and do stuff to help the clan. There aren't any specific qualifications for promotion. I'm still just an elder. Are seats open right now? Would like to join after clan chest. Yup, there are some slots open, come join when you can and if you want. Just dropped inactives - 10 slots open recruiting! @WubWub Quag summed it up, nobody goes ignored, I always watch who is donating and contributing. Hope to see you guys there! I requested join! My username in-game is just WubWub. Nice! I am finding a clan for my second account if there still space left. 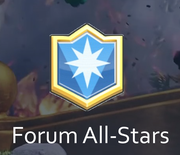 Everybody in there is active on the forums?